How about some notes about Njal’s Saga, one of the great Icelandic sagas? I have no argument, just notes. On the Pleasures of Icelandic Sagas. For some reason Iceland experienced a literary boom in the 13th and 14th centuries. Iceland was hardly unique – this is the High Middle Ages. The form of the literature is strange, though, and even unique. The sagas are prose tales that mix history, genealogy, legends, fiction, and anything else the typically anonymous author wants to include. They ought to be incoherent, and I suppose some of them are. The sagas I know – not that many – are always written in this kind of plain style. Lots of proper names. Lots of real places, well identified, stops for saga tourists. See Nancy Marie Brown, who writes about Vikings and posts at God of Wednesday, visit the site of the Althing, the annual assembly of the chieftains, where so much of the action of Njal’s Saga takes place (it is an early legal thriller). I have borrowed her photo of the Law Rock, where one-third of the law was recited from memory every summer, and where the characters declare their lawsuits. 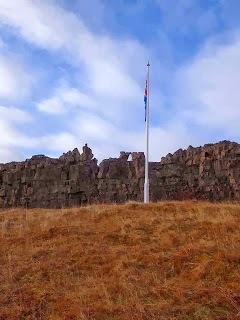 I read an edition of Grettir’s Saga that included numerous photographs of the Icelandic sites. The one I cannot forget is a photo of a boulder, the very boulder that the super-strong Grettir moved. I think it also had the ravine where he fought the ghost. There is obviously a lot of fiction in these old identifications, but also a lot of something else. The plain style is sometimes tedious. I do not believe that the opening above would by itself entice too many readers. But the style sets off the moments of tension or weirdness or wild violence peppered throughout the saga. Or, say, when one of the men tries to avoid violence only to be insulted and goaded to revenge by his wife or mother or daughter. An example. Hallgerd is the foster-daughter of Thjostolf. She has already had her foster-father kill one of her husbands for slapping her. She has married Glum, and is happy with him, but during a fight he slaps her. Hallgerd forbids vengeance this time, but “Thjostolf walked away with a grin on his face” (Ch. 16). Hallgerd was outside. She saw the blood on his axe. Thjostolf tossed the gold bracelet to her. “Then you must have done it,” said Hallgerd. There, that is what I am looking for. “Hallgerd laughed.” Yikes. I am using the Magnus Magnusson translation, the old Penguin edition, now replaced. Mere virtue and rancid matter - Swinburne's letters - The original probably verges on coarseness. In A Place in the Country (1998), the new (in the U.S., and more importantly in my hands) W. G. Sebald book, Sebald calls what appear to the naked eye to be long, detailed literary essays “extended marginal notes and glosses” (p. 5), and if that’s what those are, then I hate to think what these are here at Wuthering Expectations. So today, some genuine marginal glossing, on Volume 2 of The Swinburne Letters, Yale University Press, 1959, covering 1869-1875. When we last saw Swinburne, he had just achieved early fame and notoriety with Atalanta and Calydon (1865) and Poems and Ballads (1866). Now he is in his thirties and is settling into a career as a poet and essayist, if he does not drink himself to death first. Take a breath, Algernon! Two guesses who the “teacher” is. Here Swinburne needs to title a book of poems, but his favorite is too close to someone else’s. Lest it seems that Swinburne is all rancid matter, I suggest a glance at any of Swinburne’s letters to Dante Gabriel Rossetti (sorry, not Mar. 1, 1870 which is full of obscene parodies of Elizabeth Barrett Browning poems) in which Swinburne works his way through Rossetti’s upcoming collection of poems, including the sonnet sequence “The House of Life.” It is a high level poetry workshop in which Swinburne the craftsman weighs the sound, sense, and beauty of every detail. It is a treat to see how much this gleeful weirdo loves poetry, to see him wallow in it. A couple of years later, D. G. Rossetti cut off his friendship with Swinburne (“and no one knows why,” including Swinburne, says the editor, p. 178). Swinburne talks poetry with others – it is the only thing he really cares about – but no one else, in this book, who is really his peer. It is sad, really. Damn the minor poets. Ideas from the scrap heap, posts I thought about writing. I mean, pick a stanza of Eugene Onegin at random. There will be something interesting in it. Or work through a chapter, not just the famous duel in Chapter 6, but any of them. or share our quiet leisure. “Both this and the previous stanza, XLV, are very poor, bubbling with imported platitudes,” says Nabokov (Commentary, I, 483). Similar language was used in Toby Keith’s 2011 smash “Red Solo Cup,” which I will forever after call Pushkinian. After that, you can bet there ain’t no birds or trees in Charles Johnston’s translation of 2: XXVIII. Nabokov begins that stanza “On the balcony she liked \ to prevene Aurora’s rise,” and here we have another element that makes Nabokov’s translation something more than plain prose. “To prevene,” huh? The Russian is Preduprezdhát’, obsolete in Russian so fair game in English, says Nabokov (see Commentary I, 285). I remember that Edmund Wilson particularly hated these archaic words, proof that immigrant Nabokov’s English was better than his. Even a literal translation can have a personality. Thanks again to Tanglewood for inspiring my return to Eugene Onegin. We all enjoy a fiction that attacks fiction don’t we? Madame Bovary and Don Quixote and so on. Eugene Onegin belongs on the list. Like the Cervantes novel, Pushkin’s poem both attacks and rehabilitates. The title character, the bored dandy, is not much of a reader. The quotation I used yesterday, about how books were dullness, deceit and raving, ends with Onegin decorating his bookshelves “in taffeta of mourning black” (One: XLIV, Johnston). Books are dead. Later we discover that Onegin does read, but narrowly – Lord Byron, Benjamin Constant’s Adolphe, Maturin’s Melmoth the Wanderer. He seems to only like books in which he identifies with the main character. Literature as a mirror. Near the end of the novel Onegin turns to books to escape from heartache – “Gibbon and Rousseau, Manzoni and Chamfort… and at times even a Russian” (Eight: XXXV, Johnston). Not surprisingly, none of this works. It does serve to remind me of one of the obstacles facing the reader of Eugene Onegin, a reason Nabokov wrote a thousand pages of commentary, why the Penguin edition still has over a hundred, one page of notes per two pages of text. Of course I have read all of those authors (the ones I have not read I hid in the ellipses), and of course you have read them. But some unintended distance is introduced. Or so I guess. This never seems to bother the Janeites. The heroine’s reading is used more ingeniously. Young, innocent Tatyana Larin seems to be as corrupted by literature as Emma Roualt when the novel begins, although her models are more elevated. The perfect man is the title character of Samuel Richardson’s endless Sir Charles Grandison (1753), the perfect heroine the title character of Jean-Jacque Rousseau’s Julie, or the New Heloise (1761). The latter experience is common for readers of Grandison. Tatyana is not completely corrupted, though, since it turns out she has not read Byron or Melmoth or similar books – too naughty, I suppose. She only reads them after she has fallen in love with her idealized Onegin, once he leaves his estate after his stupid duel (Sir Charles Grandison refuses to duel). She in fact reads Onegin’s books, in Onegin’s library (“Lord Byron’s portrait on the wall”). She reads not just the books but Onegin’s marginal notes, even noting passages “where a sharp nail has made a dent.” She reads, in other words, not to find herself but to find Onegin, and what does she find? a parody, an empty show? (Seven: XXIV, Johnston, ellipses in original). Fiction is both cause and cure. Onegin just mimics his fictional models. Tatyana critiques them. He drifts, she matures. Thomas Carlyle has a line in Sartor Resartus that always makes me laugh – “Close thy Byron; open they Goethe.” Pushkin proves Carlyle wrong. Tatyana finds wisdom by opening someone else’s Byron. I guess I first read Eugene Onegin twenty-five years ago, in Vladimir Nabokov’s 1964 translation, which is accompanied by about a thousand pages of commentary. I read that, too, all of it. Seven or eight years ago, sometime before the aborning of Wuthering Expectations, I read Charles Johnston’s 1977 version. Recently I reread Nabokov’s version and immediately followed it with a return to Johnston’s, which I have not quite finished. Both translations are super. Each one presents about, let’s invent a figure, 30% of what is in Pushkin’s poem; read jointly, 40%; read with Nabokov’s commentary, 50%, along with some choice Nabokov. This is pretty good. Readers with what they claim are principled objections to reading poetry in translation are fools. I fear that on occasion in comments I have steered people away from Nabokov’s translations, succumbing in retrospect to the notion that it is – well, I do not remember what. Dry, pedantic? It is unpoetic, certainly, but nevertheless artistically effective and emotionally moving to the extent the ironies of the poem allow much emotion. See, for example, Tatiana’s final speech (“Today it is my turn,” Eight: XLII) and thunderclap exit from the book. Eugene Onegin is, among other things, a fine narrative with complex characters and interesting movement of plot. An attentive prose translation has a lot to work with. Several of the recent readalongers used James Falen’s 1990 translation, which I have only read in their excerpts. It sounds good, too. Both Johnston and Falen maintain Pushkin’s stanzaic form and rhyme scheme – it is a kind of modified sonnet, fourteen lines with a punchy closing couplet. They both end up sounding something like a watery, domestic Lord Byron, an appropriate tone given Eugene Onegin’s period and frequent references to Byron. Yet, to stick with the one I have read, Johnston, the fetters that squeeze arbitrary rhymes out of the substance of the story are balanced by a nimble sense of tone and sufficient cleverness. The key scenes, Tatiana’s surreal prophetic dream in Chapter 5 or the duel in Chapter 6, are terrific. A duelist has died. The previous stanza ended with a list of trivial romantic clichés about young death (“the bloom has withered on the bough”). This one is rather different. Not unsurpassable. Pushkin presumably surpassed it. The Tanglewood book blog ran a readalong of Eugene Onegin (1825-32), Alexander Pushkin’s novel – or novella, or short story – in verse, a high point of Russian poetry and not so bad in English translation, either. The Tanglewood link should lead to many of the readalongers. They read on a schedule and posted regularly, which was enjoyable to read. Some Pushkin every week. Onegin is a bored St. Petersburg dandy who inherits a country estate where he becomes entangled with young Tatiana, who falls in love with him, and young poet Lensky, with whom he fights one of the earliest in a long line of idiotic Russian literary duels. These are the only three characters of real consequence, and I am perhaps giving too much credit to poor Lensky. these for the nails, these for the teeth. This is Vladimir Nabokov’s translation. One might object that this ain’t poetry. One might object that the first few lines ain’t English, although they ai, however bent the syntax. Nabokov’s is a literal translation that sacrifices rhyme and rhythm but introduces no extraneous matter, the great if necessary sin of any translator attempting any sort of poetry. He keeps all of the wonderful stuff, which is want I want here. The entire passage – virtually the entire opening chapter – this rapid tour of a life of idle partying in the capital, is a digression from the story of Eugene and Tatiana, but note the digression within the digression, where the mention of nail files triggers an irrelevant anecdote about Rousseau. It is thematically relevant, part of the patterning of the novel, but in this spot it mostly serves to characterize the easily distracted narrator. Ah, little feet, little feet! Where are you now? Where do you trample vernant blooms? the country of my fathers, and confinement? Mais où sont les pieds d'antan! Another advantage of literal translation is that with some luck the rhetorical mode of the passage is clear. Is this supposed to sound ridiculous? I mean, “fostered in Oriental mollitude”! Yes, yes it is. Eugene Onegin is a masterpiece of mode, parody, and allusion. Also image, character, and story. Also, I am told, Russian verse. I will have to live without that. Kierkegaard’s humor often comes from his inventiveness, as he pursues an idea, for example describing a true “knight of the faith” as an accountant who walks “as sturdily as a postman” and “thinks about the special hot dish which his wife has been preparing for him, a grilled lamb’s head garnished with herbs perhaps” – given the chance, “he will discuss it with a passion” (107), the grilled lamb’s head, a classic Danish dish which you should not Google if you do not want to see a photo of a grilled lamb’s head. I am still not exactly sure what a “knight of the faith” is meant to be. I suppose I should be pulling out some sharp aphorisms, too, but Kierkegaard is no G. C. Lichtenberg, and I find his inventions, these little characters than emerge, more amusing than his sayings, although those are not bad either. But Abraham prepared everything for the sacrifice, gently and quietly, but when he turned aside and drew the knife, then Isaac saw that his left hand was clenched in despair and that a shudder passed through his body – but Abraham drew the knife. So Abraham’s entirely human and understandable – almost necessary (that’s another one of the variations) – moment of doubt is destructive. Kierkegaard immediately turns these scenarios to a complex argument about faith, dread, and despair that I did not understand at all. Whatever fragments Auden used went unrecognized, except for the four stories themselves; whatever idea I was supposed to be following was replaced by an idea about narrativity, about how stories imply other stories, with especially rich stories implying many other stories. Once each new story is recognized – told, written, imagined – it becomes a permanent part of the original story. Maybe it was invented, maybe it was there all along. Meanings accumulate, too, complementary or contradictory, but unresolvably so, because as stories they may well all be true. Or many of them may be true. Or none. Who knows. In other words, I recognized in Fear and Trembling the Kierkegaard of Borges and Derrida, or a simple outline of such a creature. I read Kierkegaard, and all philosophy, as if it were literature, and perhaps too much as if it were about literature, but in this narrow case it really was. * Page numbers from The Living Thoughts of Kierkegaard, so I have no idea which book this is from. I read a bit of Søren Kierkegaard rather than Hegel. Actually, understanding Kierkegaard is another reason to read Hegel, another place Hegel kept popping up, even in the strange mangled hybrid book I read, The Living Thoughts of Kierkegaard (1952). I disagree on one point. It would be funnier to make the disclosure in the afterward. Even funnier, never disclose that it was merely etc. Pretend you mean every word. The greatest prankster that has ever lived. Kierkegaard came to English-language attention fairly recently. A major translation effort brought his major works into English in the 1940s. W. H. Auden plundered these books to create his. It was supposed to introduce Kierkegaard to a wider audience. Did it? I don’t know. However useful the book is, it has two massive problems. First, any possibility of coherent argument is destroyed. A three page excerpt from one book is followed by a paragraph from another. Which books? Which bits are from published texts and which from private journals? Auden does not say. Then, second, the hilarious Kierkegaard pseudonym system is destroyed. Fear and Trembling (1843) was written by Johannes de Silentio, The Concept of Dread (1844) by Vigilius Haufniensis, other books by Hilarius Bogbinder, H. H., and Anti-Climacus. Kierkegaard had books that contradicted each other published on the same day. Either/Or (1843) has various authors arguing with each other within the book. What a shame to throw out all of this. To a book blogger of a certain temperament, it is practically the best part. Some of what we now blithely call “Kierkegaard” is a pose or a parody or fiction. Auden’s book gives no hint of dates either. Just glance at those above. Kierkegaard spent a decade working privately, and then kaboom, this amazing mass of published material in the 1840s and on to his death in 1855. Of course this is why there are so many anthologies of mangled Kierkegaard excerpts. Even chopped up (or because), I found much of Kierkegaard’s (or Anti-Climacus’s) thought to be difficult or beyond comprehension, such as a concept of subjectivity that went well beyond ordinary English usage, or a sharp distinction between the “aesthetic” and “ethical” that appeared arbitrary in its either/or divisions. I would be surprised if I got something out of one page of five. Now that I understood. I am doing my part to prove Kierkegaard right. And honestly, one page out of five is a success. If I thought I could hit that mark with Hegel, I would read him too. So tomorrow, thought experiments, Kierkegaardian comedy, philosophy as a form of play. Some of the parts I think I understood. She will not read the philosophy of Hegel. She can neither make a pancake nor darn a sock, and she will not read the philosophy of Hegel. This misguided fellow, an Isak Dinesen character, is thinking of marrying – these are reasons not to marry the woman, if you can believe it. I say marry that lady and go out for pancakes. Here I am looking at Seven Gothic Tale s (1934), “The Poet,” p. 385. I, too, will not read Hegel, although in some sense I should. He has been popping up everywhere. Herzen is allowed to mock because, he says, “Carried away by the current of the time, I wrote exactly the same way myself.” Plus, as he describes at some length, he successfully absorbed but also eventually purged himself of dialectical “scholasticism” – “I stretched its bow until the string snapped and the blindfold dropped from my eyes” (403). I really need Hegel for Henrik Ibsen, as serious a Hegelian as Herzen once tried to be, with what level of understanding I do not know. Brand and Peer Gynt make sense dialectically, a thesis and an antithesis. The synthesis may be Emperor and Galilean, Ibsen’s long play about Emperor Julian, although I do not see how. The latter play, with its unusual two part structure, presents another thesis and antithesis – they are right there in the title, Classical and Christian, and a synthesis is discussed in the text, a Messiah figure that blends the two. That does not work out well for Julian, but perhaps it describes the age Ibsen saw himself living in. Even better, Ibsen scholar Brian Johnston has argued at length that the twelve “realist” plays written from 1877 to 1899, including A Doll House and Ghosts and so on, were not meant to be taken as separate plays but in fact make up a single long tragedy “whose subject was modern humanity undergoing (in Hegelian terms) a journey of spiritual recollection,” with each play covering one of twelve steps from The Phenomenology of Spirit. This sounds nuts – the kind of nuts I like. Johnston, who died a year ago, put all of his work up at Ibsen Voyages, and I plan to loot it thoroughly as I read Ibsen’s plays, but with just a tinge of regret that I will not really be able to evaluate the argument about Hegel, because I will not read the philosophy of Hegel. I know my limits. It won’t do any good. I will ease myself back into Scandinavia by going back to the beginning, to the Iron Age tribes unearthed in The Bog People (1965) by Danish archaeologist P. V. Glob. Glob was closely involved with the excavation and analysis of some of the most famous bog people found in Denmark, including the Tollund Man and the Grauballe Man, so he writes in some detail about those finds, including numerous photographs of the mummies and their artifacts. Also photos of the various bogs, all of which look exactly the same. Subsequent chapters catalogue other discoveries of bog people in Denmark and elsewhere and draw some conclusions about the society and culture in which the bog people lived and died. His argument is that a number of the mummies were the victims of human sacrifice. Last summer I saw some bog mummies for myself, in the Gottorf Castle in Schleswig, including the Windeby “Girl” (actually a boy). The bog people are a fascinating subject for their own sake, uncanny in the preservation of their faces, or eyes, or fingerprints, or stubble, depending on the luck of the bog. Black and white photographs are ideal for conveying the resigned expression of the Tollund Man, even if the expression must to some large degree be a matter of chance. Why, though, read this book on the subject? It is incomplete and outdated, containing errors of fact (see the parenthetical above) and interpretation. Why not read a more recent book? Why does NYRB Classics have it in print? Two reasons. One is that Seamus Heaney read it (“my Christmas present to myself back in 1969”) when Rupert Bruce-Mitford brought it into English (I am actually reading this edition, not the NYRB version). He was deeply struck by the humanity of the mummies and wrote a number of outstanding poems about them. Still, another book with the same photos would do. Glob is writing with the distance and rhetoric of a scholar, constructing a culture and religion out of the physical evidence in the museum he ran, not just the mummies and their nooses and blindfolds but a stunning silver cauldron and some gods hacked out of logs whose survival is as unlikely as that of the bog people. Still the gaps are so large, and Glob’s sympathy for these distant people is so great. The Tollund man and many of the other bog men, after their brief time as god and husband of the goddess – the times of the spring feasts and the wanderings through the villages – fulfilled the final demand of religion. They were sacrificed and placed in the sacred bogs; and consummated by their death the rites which ensured for the peasant community luck and fertility in the coming year. At the same time, through their sacrificial deaths, they were themselves consecrated for all time to Nerthus, goddess of fertility – to Mother Earth, who in return so often gave their faces her blessing and preserved them through the millennia. (190-1). Glob wrote a legitimate successor to Sir Thomas Browne’s Hydriotaphia, Urn Burial, or a Discourse of the Sepulchral Urns lately found in Norfolk (1658), another work that begins with descriptions of recently discovered archeological remains and slowly turns into a meditation on mortality, how they died leading to why they died culminating in why we die. Two more modes or lodes or nodes Wells uses in The First Men in the Moon. Politics and science. The novel is not just an excuse for inventing wondrous atmospheric explosions and moon sunrises and so on. It is also an anti-imperialist allegory. Not a bad one at that, although Wells makes one really cheap decision. His moon is, it turns out, abundant with gold. Sure, why not gold. It was really the spears that caught my attention, though. The moon people are a highly advanced, tightly organized society that fights with spears. The Anglo-Zulu Wars were fought in 1879, not that long before the novel was written. I suppose there are other relevant colonial conflicts. I don’t know. The science – that actual science. Wells was trained as a biologist. Jules Verne wanted him to be an engineer, but in The Time Machine and The Island of Doctor Moreau and The War of the Worlds, the scientific principle under investigation is that of Charles Darwin. In The First Men in the Moon Wells ingeniously prefigures sociobiology. The moon people are part of a superorganism, an ant colony that has evolved to the point of employing language and advanced technology by means of extreme specialization, each individual “exquisitely adapted to the social need it meets” (Ch. 24). Wells is the prophet of E. O. Wilson. These two strands, the political and sociobiological, are combined at the novel’s end, as the scientist fumblingly explains to the big-brained ruler of the moon ants impossible concepts like nations, democracy (“When I had done he ordered cooling sprays upon his brow”, Ch. 25), and war. However extraneous the satire, Wells does fold it back into the plot in the last few pages. He is still a novelist more than a reformer at this point. The scientist becomes the simian snake in the moon ant Eden, destroying their innocence and leading them to commit their first act of war. The sequel can be found in what must now be hundreds of science fiction novels, stories, and movies. The two lunonauts land their gravo-sphere in a moon crater just before sunrise. Wells imagines that the moon’s atmosphere freezes into a kind of snow during the two weeks of darkness, and then rapidly, almost explosively returns to its gaseous state when the sun reappears. This is a sample of Chapter 7, “A Sunrise on the Moon.” Besides an element of chemical thermodynamics, and a bit of literal atmospherics (“shift and quiver”) this is just good invention and good writing. No amount of science plops that wet handkerchief into the crater. All of this seen “you must bear in mind… through a thick bent glass, distorting it as things are distorted by a lens, acute only in the centre of the picture, and very bright there, and towards the edges magnified and unreal” (Ch. 8). Even if it is all made up, what reader does not want to see the creation of the moon-air? I know the answer to that question: readers who claim to have no visual sensibility and skim or skip descriptive passages. The rest of us will take that last phrase – “magnified and unreal” – as literal within the story but also a metaphor about how we are reading and what we are imagining. Just thinking about these descriptive flourishes, I would call The First Men in the Moon the best written of the Wells novels I have read. It is also the most comic – the most purely comic – a result, as I mentioned yesterday, of the necessity of winking at the long tradition of moon journeys. Between the jokes and the nuggets of especially good writing, the novel was a treat. Wells had a couple more modes which I will save for tomorrow, plus the adventure story mode which I will skip as more standard stuff. Let me get these curiosities out of the way here. Did you know that Jack Kirby stole the huge-brained, tentacled Kree Supreme Intelligence directly from The First Men in the Moon, Chapter 25, “the enhaloed supreme intelligence that hovered above me”? Now I am talking about superhero comics. Between one and zero Wuthering Expectations readers care about this. Tolkien fans may want to compare certain passages from the flight through the caves in Chapters 15 through 16 to certain passages in the “Mines of Moria” section of The Fellowship of the Ring. What I should be doing is continuing on with Ibsen, writing about his ungainly ten act masterpiece Emperor and Galilean. But at some point I took a break from Ibsen to read The First Men in the Moon (1901) by H. G. Wells, so now I will take a break to write about it. Easier to read, easier, to summarize, easier to bat around. Summary: An absent-minded scientist, Cavor, invents an anti-gravity metal, Cavorite. For some reason the first thing he does with it is fly to the moon. For some other reason he takes a venal bankrupt with a fancy prose style with him. The men are captured by the moon-men, the Selenites, and taken to their phosphorescent moon-caves. Thus the puzzling preposition in the novel’s title. Wells wrote “in” and meant it. The bankrupt escapes and writes a shocking and, frankly, almost unbelievable memoir about his experiences. The literary tradition of trips to the moon goes back at least to Lucian’s True History (2nd century), where the method of transport is a whirlwind. A knight in Orlando Furioso (1532) gets to the moon by hippogriff. Jules Verne shot his astronauts to the moon with a giant cannon, much like Georges Méliès did in A Trip to the Moon (1902). The 1993 Everyman paperback I read has a lot of baffling stuff about the reaction to this particular Wells novel, a lot of nonsense about science and Wells as a “prophet,” even though a trip to the moon is less of an original prophecy than anything Wells had written before. The passage above is a winking acknowledgment. The Wells novel is almost nothing but invention, some of it absolutely marvelous, some of it satirical and even political, some of it just for laughs. The First Men in the Moon is a fifth book of Gulliver’s Travels, or Alice in Lunarland, or the teleplay for Laurel and Hardy in Space. I am not sure who should play the scientist, Laurel or Hardy. The movie would work either way. There is even some science, although not where it seems it should be. Ignore Verne’s misdirection. Remember The Time Machine (1895) and so on. I might be able to avoid Ibsen for several days with this piece of fluff. The quotation in the title is from Chapter 13. My temptation is to wander through Act V of Peer Gynt in the same way I pawed through my favorite bits of Act IV. “Part of the lasting strangeness of Peer Gynt is that it is more of a trilogy of drama than a single work” writes Harold Bloom in The Western Canon (p. 339). A small part of the strangeness, given all of the other strangeness, but this is true. I guess I will not do that. The play ends with some sort of escape from or transcendence of death, or with a great victory of the Female Principle, or It Was All A Dream (“Sleep and dream, my dearest boy!” is the last line), or Peer never did get out of that insane asylum at the end of Act IV, or he was there all along, or he died earlier in the play without my noticing, since he is still there, on stage. At this point I am not going to choose an answer or try to reconcile them. I see why I always want to refer back to the clearer, narrower Brand as a handhold. Whatever else the two plays have in common, the central characters are big, full of life, and should be played big. The paradox of Brand is that his gusto is so destructive. Peer Gynt, and the acting of Peer Gynt, ought to be fun, like Mephistopheles in Faust of Falstaff in Henry IV, two characters so big it took two plays to contain them. PEER GYNT: Let go that hand! THE COOK: Spare me please! Think of my children, what they’ll lose! This scene has another of the play’s many blasphemies, as the cook drowns while trying to recite the Lord’s Prayer. “Give us this day our—(Goes under).” I am not sure why the character is a cook. If it was just for this “daily bread” joke, he should have been a baker. PEER GYNT: Clear off, you monster! Get away! I won’t die! It’s the land for me! Look, I am on the verge of doing what I swore I would not do. I will just repeat the paradox, that in literature liveliness outweighs many sins. Who would want Falstaff to reform? Brand is a single-minded and intense play about a monomaniac proving himself right, whatever the cost. Of course he is not actually right, which is irony. Or perhaps he is partly right, which is ambiguity. Regardless, Ibsen marches his fanatic down one mountain and up the other, trimming everything away until nothing is left. PEER GYNT: Who are you? In Act III, Peer Gynt returns to the natural world, down from the mountain, to say farewell to his dying mother in that wonderful scene I looked at yesterday. Then he is off “[t]o the sea… and farther still” (III.iv.). The whole load on top of me! Ugh, horrible - ! Try to imagine this philosophical scatology in a English play from 1867. I wonder how this scene is staged. Monkey puppets, maybe. Peer Gynt fantasizes about recovering the desert by flooding it. He has an affair with a houri. He engages in archaeological research, discovering the statue of Memnon that sings at sunrise. The statue of Memnon shows up in one of the Ubu plays, where it is thrown in the toilet. The statue reminds Peer Gynt of the King of the Trolls, while the Sphinx, in the next scene is more like the Great Boyg, a puzzle since the Boyg was invisible. In the Oedipus story, the Sphinx asks a riddle, but here it is Peer Gynt who asks the sphinx questions. PEER GYNT: Hi, Boyg, who are you? Ach, Sphinx, wer bist du? PEER GYNT: What? An echo in German? How odd! THE VOICE: Wer bist du? PEER GYNT: The accent, it’s very good! This observation is new, and mine. PEER GYNT: So he’s the explanation. Mythologists and Sophocleans will likely note that the answer to that other Sphinx’s riddle was “A man.” The next and final scene in the act takes place in a lunatic asylum, making me wonder if that is where Peer Gynt has been all along. I guess I have just been cataloguing the free weirdness of Act IV. The final act is similar, with taking Threadballs, the return of the Troll King, and three different avatars of death. This stuff would not exist without the example of Part II of Goethe’s Faust (1832), but once Ibsen has borrowed Goethe’s free dramatic form and inventive use of symbolic characters, the contents are all his own. This is all a lot of fun. Brand (1866) is a long play in verse about a Norwegian pastor who seeks martyrdom and finds it. “Mere lifelong sacrifice / itself may not suffice” (Act II) describes the action well. Pastor Brand begins up in the mountains, descends to the coast, and again ascends the mountain when the play ends. Peer Gynt (1867) is a long play in verse about a Norwegian folk hero who seeks himself. “I gave up love and power and glory / Since being myself was more necessary” (V.viii.) describes the theme if not the action of the play. The action is wild. Peer Gynt also begins his play up in the mountains where he has ridden a giant reindeer buck off a cliff, or at least claimed he did – the first line of the play is “Peer, you’re lying!” – before descending to the coast and the desert and then returning to Norway and the mountains as the play ends. There are parallels between the plays, is what I am saying, even though the plays and characters in many ways stand in opposition. Brand has too much self, is too sure of himself, while Peer Gynt has almost no self, adopting roles as they comes along – hero, troll, slave trader, emperor – whatever is handy. The mothers of both Brand and Peer Gynt die in the third act of their respective plays. Brand refuses to see his mother or comfort her in any way because she refuses to sacrifice her miserly fortune, even on her deathbed. And sing you ballad and song. AASE: No, my Bible! I’ll read the Apostle. My thoughts are weighing me down. There’s a feast for the king and queen. We’ll drive there over the snow. AASE: But – I have an invitation? AASE: Dear heart, what is it, that ringing--? PEER GYNT: The silver sleighbells you heard! Saint Peter awaits at the castle gate. There are cakes with wine and coffee at the party. Peer Gynt even concocts a little drama where Saint Peter keeps his mother outside, but God himself intervenes to let her in. Isn’t that how I said it would break? Now they’re singing a different tune! And at this point the mother dies, led personally to heaven by her sacrilegious, blaspheming son. There – that was thanks for the ride. Peer Gynt is in places so crazy, with its invisible trolls and singing statues and talking threadballs that Ibsen risks losing the humanity of his characters, but not in this fine scene. Henrik Ibsen escaped a narrow little town much like (or so I imagine) the one in Kielland’s Skipper Worse. His plays began to be performed when he was only twenty-two years old, and he was employed as playwright-in-residence at a theater company by age twenty-three. This should be where my interest in Ibsen begins, but I have not come across an Ibsen scholar who has not steered me away from his first ten plays, mostly pastiches of Norwegian history or Viking sagas modeled on the history plays of Schiller and Shakespeare. Too specialized for non-specialists. And not all that good, even though one is titled The Vikings of Helgeland, which seems like a sure thing, but I guess not. But no, the plays mostly flopped and Ibsen’s theater went bankrupt. So he escaped again. In 1864 he went to Italy with the help of a government art’s grant. Inspired by the Italian air, or Roman antiquities, or a crisis of vocation, Ibsen quickly wrote a pair of verse drama masterpieces, Brand (1866) and Peer Gynt (1867) that made his name in Norway; a related closet drama, Emperor and Galilean followed in 1873 – it has ten acts, so I am assuming a big closet. Now, finally, we get to the so-called “realist” plays that revolutionized theater around the world, Hedda Gabler and Ghosts and so on, twelve plays in twenty-three years. To see what Shaw and O’Neill and Schnitzler are doing, these are the plays that will be helpful. Those earlier plays are off in their own world, maybe even, in retrospect, dead ends. But they are so good! So I would like to spend a little time writing about them. I wrote about Brand a bit a couple of years ago, a post about trolls and another about martyrdom, both posts shadowed by Alfred Jarry’s Ubu plays, which make explicit reference to Peer Gynt, perhaps even in Père Ubu’s name. I have come at Ibsen from the wrong direction, from Jarry’s travesties rather than Shaw’s social reform. Of course I am suspicious of received ideas about Ibsen. Of course Peer Gynt is not a dead end. I read Brand in Geoffrey Hill’s version, so it is trimmed but in first-rate verse. Peer Gynt is Rolf Fjelde’s, Emperor and Galilean by Brian Johnston, two premier Ibsen scholars presenting every word of these long, crazy plays, leaving the dirty work of cuts to stage directors so I could enjoy the whole thing. All right, good to get this out of the way. Next, text. The novels of Alexander Kielland was recommended by JeffryHouse back when I was soliciting advice about Norwegian literature. I tried the 1882 Skipper Worse, which was short, engaging, and useful, and sometimes even artful. I can easily recommend it myself to people who are for some reason concentrating their attention on Norwegian fiction. That is meant to be narrow, but it obviously includes me. Skipper Worse is a ship captain who in the lively opening scene returns to his small town after a long absence, “the first time a ship from that area had made the journey to Rio de Janeiro” (20), so his return is a triumph. Worse becomes entangled with the town’s severe pietistic sect. Kielland was a left-wing reformer, so he has no qualms about making some of the pietists as villains and hypocrites, as when greedy Madam Torvestad keeps her daughter from a love match within their faith by essentially selling her to the wealthy Skipper Worse, thereby ruining his life, her life, and the lives of several others. The horrible Madam Torvestad arranges a marriage for her younger daughter, too, this time motivated not by greed but spite. For some reason I have been reading a lot of stories about arranged marriages lately, almost all ending (or beginning) in disaster. But those in Skipper Worse have been the worst. All of this was fine, but the best parts of the novel were a bit separate from the story, scenes of action in the life of the little Norwegian port – a terrible storm in Chapter 15 and the arrival of the herring fleet in Chapter 5. Maybe I should have preceded that with a lunch spoiler alert. The girls are mocking the only people in town who to not have to gut herring, the “pale and sallow youngsters” who have to go to school, crushed by “the weight of Greek and Latin books, their thoughts confounded by the demands of a long-gone culture, their brains full of grammar” (66). One reason I wanted to read Kielland was to see at least some of Norway through a writer other than Henrik Ibsen and Knut Hamsun, both of whom were huge weirdos, but it seems Kielland is a weirdo, too, at least when it comes to Latin. The editor tells me that Kielland is the author of a trilogy of novels that “might well be the most searing attack on formal education ever produced,” beginning with the 1883 Gift (translated as Poison), which “attacks the teaching of Latin as the most soul destroying activity ever invented” (167). Deeply tempting crankery, but I guess not in English. I read the Cross-Cultural Communications edition of Skipper Worse, 2008, tr. Christopher Fauske. Alexander Kielland is also an offshore drilling platform that suffered a catastrophic disaster. Norwegian oil drilling rigs are named after writers. Pip is writing Great Expectations long after its events, maybe thirty-five years from the first scenes and twenty years from the end of Chapter 58. Some of this is explicit, some I am inferring. Thus Pip’s ironic tone towards his own life story. He has achieved some critical distance. So many problems are solved by this device. In many earlier novels, Dickens has trouble creating interesting, non-stereotypical heroines. He has trouble with heroes, too, but it takes him longer to figure out what to do with idealized, too-virtuous women. But when Pip idealizes the perfect, wise Biddy, I am learning something not about the limitations of Charles Dickens but about the psychology of Pip. It makes sense for Pip to make Biddy perfect, or, in particular, to always make her sound like an adult even when she is nine years old. Maybe that is how Pip remembers her. Maybe that is how he wants to remember her. Similarly for the idealized father-figure Joe, who admittedly also has a lot more personality; similarly for the idealized (quite differently idealized) Estella. Pip is telling the story his way. And see that quotation about Biddy and the black-currant leaf, just the kind of action that gives the illusion that the character has a life outside the book. Dickens writes a character a certain way in the third person and it is a flaw. He writes her the exact same way in the first person and it is clever. Yes, that’s right. A new problem is created: why is Pip such a good writer? Like the other Dickens first person narrators, David Copperfield and Bleak House’s Esther Summerson, Pip is not quite as good a writer as Charles Dickens, but he is still awfully good. Scott Bailey has been writing about the case of Bleak House, where he works on the difference between Esther and “Dickens.” This is the one place in Great Expectations where I really have to suspend my disbelief. But it is a familiar problem. Pretty strange, like a Breughel painting. At the end of Chapter 31, Pip dreams that he has to “play Hamlet to Miss Havisham's Ghost, before twenty thousand people, without knowing twenty words of it.” There are some other examples. This might have made a good blog post. Here is the core of another post I thought about writing: Great Expectations is a straightforward parody of the “benevolent patron” device that Dickens has leaned on since The Pickwick Papers (1836), where a jolly rich fellow swoops in and fixes whatever can be fixed at the novel’s end. Dickens has been undermining his own device since Bleak House, where he is more subtle about it, but by the time of Great Expectations the mine has apparently been dug and it is time to fill it with gunpowder and demolish the benevolent patron for good. I guess I will wait to write that post after the next time I read Bleak House. For this one, the credit goes to Dickens, not Pip.